The education of young children requires teaching through play, because kids do some of their most important learning when they are free from rigid lesson plans, so teachers who engage them in meaningful activities are likely to find that children absorb lessons best when they are having fun. Owners of day nurseries are smart to organise their centres so that children have opportunities for both structured learning and creative play, with the greatest emphasis on creativity and exploration. To children, the whole world is new and fresh, so all experiences are “learning experiences,” making it easy for caregivers to utilise play time for educational purposes. Children often employ all of their senses when exploring the world, so seeing, hearing, smelling, tasting, and touching should all be encouraged when safe and appropriate. Young learners are not yet capable (or patient enough!) to sit and listen to teachers explaining broad concepts, but when they are shown how things work and allowed to practice in hands-on ways, they are quick to absorb new ideas and their depth of understanding about the world increases. As they get a bit older, it’s good for kids to learn to sit for increasing periods of time so that they develop the patience to stay on a single ask until it is completed. Most children are naturally creative and enjoy games of make believe, so things like dress-up clothes and puppets are good tools for encouraging their creativity and allowing them to develop social skills through games of pretend. While some portions of education involve teaching straight facts, well rounded learning includes a balance of academic, creative, and social development. Even computer and video games can have a place in children’s education, so day nursery owners may want to include teaching games as a part of their overall curriculum. Well supervised internet time can be fun for kids, and a number of sites offer free online games, some of which may be beneficial in holding the interest of today’s techno-savvy kids. The best way to keep kids learning is to be sure that they are enjoying themselves during the process. When children get bored, they are likely to lose interest and misbehave. Young children do best when engaged in activities that last only a short amount of time, allowing them to move onto another “lesson” quickly, increasing the chances that they will look at learning as a fun adventure. Adding music and movement into lesson plans can make the experience more fun for kids of all ages – and for adults, too. 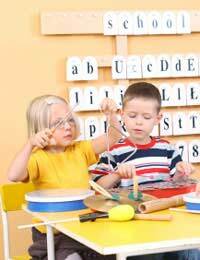 Finally, it’s important for daycare teachers and helpers to incorporate learning into all activities throughout the day. For example, meal and snack times offer good opportunities for talking about table manners, how fruits and vegetables grow, and basic nutrition. All parents hope that their children will be blessed with caregivers who support and encourage intellectual development, so day nurseries that make it a priority to maximise opportunities for teaching are sure to earn good reputations with clients. Creating an environment that is conducive to learning without making it feel too regimented can take a bit of planning; there needs to be a good balance between structured play and free time, indoor lessons and outdoor activity, and finally, activities that support social as well as academic development. When a centre has properly structured their schedules and lesson plans, the days flow seamlessly, with kids transferring from one activity to another with ease. Because working with children requires a certain level of flexibility and a willingness to stray from the plan when necessary, day nursery owners and their employees should begin with well thought out plans that incorporate time periods for active play, creative expression, nourishment, rest, socialisation, and intellectual stimulation, but they should also be prepared to change gears with little notice on days when the “plan” just doesn’t seem to be working well.